Located on the heart of Seoul, the canal looks like a long green flow of life where Nature has taken over the urban landscape. In between two bridges – symbols of crossing and passage – a line of water flows deeper towards its roots, impervious to urban turbulences. Isolated and protected from the rest of the city, visitors walk along the canal : escaping from the urban hassle, they reflect and let their dreams flow. 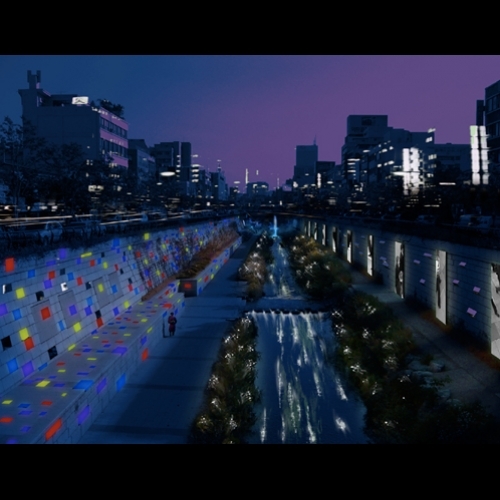 Embodying the spirit of the canal, the wall turns into a flow of life, and light : inserted in its sides, bricks composed of LEDs and oblong mirrors diffract the sunlight during the day while, at night, the colors come to life and star changing, in tune with the intensity of the wind. In parallel, black and white images of visitors (which walked along the canal during the day) slip away on large vertical screens, as a trace of constant flow. Enlivening the water, long and luminous algae light the canal from within in a magical way.